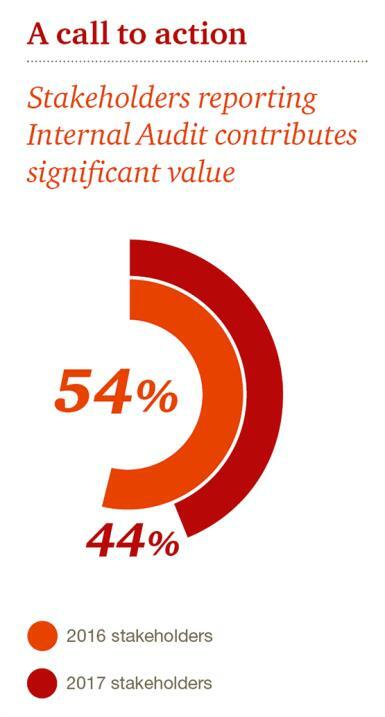 Internal audit functions are failing to keep up with stakeholder expectations of internal audit value, according to PwC USA’s 13th annual State of the Internal Audit Profession study. The study revealed that 44% of stakeholders held the view that internal audit is contributing significant value, its lowest level in five years, and on a decline compared to 54% in 2016. The respondents were made up of internal audit executives and stakeholders, including audit committee members and chairs, board members, CFOs, CEOs, CCOs and CROs. Of the 1,800 respondents, only 18% reported that their internal audit functions play a valuable role in helping their companies anticipate and respond to business disruption, noted as Agile Internal Audit (IA) Functions. Few (7%) considered internal auditors to be a trusted advisor, nearly half of respondents (48%) wanted internal audit to take on a more integral role, to be a trusted advisor to business within the next five years. The survey was used to explore the disruptive environment and to discuss two key traits that enable Agile IA functions to effectively lead in disruptive environments, to identify them and the business needs. Of Agile IA Functions 84% were mindful of disruption and included the possibility as part of the audit plan development, compared to 50% of less agile peers. Flexibility is also important, to be transformative across development, planning, fieldwork and reporting and to use innovation or reorganise resources according to disruption. Additionally, 73% of Agile IA Functions change course and evaluate risk at the speed required by the business.